At Fairlight Books, one of our 2019 New Year’s resolutions is to ramp up the amount of blogging that we do about all of the UK’s fabulous bookshops. This week’s blog is about The Mainstreet Trading Company, which won Britain’s Best Small Shop 2018. One of the great successes of Mainstreet Trading is the fact that it has become a destination venue, attracting visitors from many miles around. Vivian Bannerman, the assistant bookshop manager, gave us a tour of the store and shared a few tips with us about how they have made it such a focal shopping venue for the region. Bookshop, café, deli AND gorgeous home store – this is a venue worth making a day trip to visit. Take a morning walk along the river and then grab a warm hot chocolate or lunch at the Mainstreet Café before browsing for your next read. The sleepy little village of St Boswells, famous for the salmon and brown trout of its River Tweed, might seem an unlikely spot for a destination bookshop, but The Mainstreet Trading Company is exactly that. Positioned two thirds of the way from Newcastle upon Tyne to Edinburgh on the A68, the village has one hotel (perfect for the anglers and walkers), one award-winning butchers, one fish and chip shop and – yes… one award winning bookshop. The Mainstreet Trading Company was founded ten years ago and last year won the title of Britain’s Best Small Shop 2018 at the Independent Retailers Confederation Awards. It’s a shop which draws customers from many miles around, and it’s not hard to see why. Not only does Mainstreet Trading have an enormous range of books, beautifully laid out on tables for relaxed browsing, but its deli and home store are havens for foodies or for anyone looking for beautifully sourced, eclectic homeware. We were treated to a tour of the shop by its bookshop manager, and she shared with us some of the fantastic features of the shop. One of the first things that we loved about this bookshop was how many books they’ve managed to display cover-out. When you don’t know quite what you fancy reading next or if you are trying to find a gift for someone and need a little inspiration, that’s always really useful. Of course, as a book lover it can also be troublesome because it’s impossible not to come away with one or two books more than you intended, but if you’re a book hoarder like us, that’s not necessarily a problem. If there is something specific you are after, the shop has an extensive range of stock on the shelves and carries all the classic series – so hopefully they should have what you are looking for, or at least will be able to order it in for you within a day or two. And if you’re still stuck for what to get someone as a gift, they do offer book subscription packages and also carry a wide range of stationery, notebooks and greeting cards. One of the things we like about bookshops is how they often go out of their way to create fun things for the kids to do. One of the features we’d not seen in a bookshop before, which we absolutely love at the Mainstreet Trading shop, are their two little hideaways, called the Book Burrows, where children can sit and listen to audiobooks. Integrated into the bookshop is the café-come-restaurant with a menu inspired by the extensive range of cookbooks that they stock. Many of the ingredients come from local producers including the Ouseburn Coffee Company and Peelham Farm, a producer of organic meat and charcuterie. Don’t miss their ‘Authors at Mainstreet’ noticeboard which is on the main wall of the café. It has pictures of recent authors who have visited for book signings. Great fun to test your famous author knowledge and see how many you can recognise! Behind the main bookshop is the deli. Opened by Tom Kitchin in 2012, it specialises in selling food from smaller, independent food producers, with a particular focus on charcuterie, cheeses, coffee and craft beers – fantastic for indie businesses supporting each other, we love it! Don’t miss the lovely looking and totally delicious Ocelot chocolate bars, by Edinburgh-based husband and wife team Matt and Ish. The deli also has a great range of unusual wines – harking back to its heritage when the bookshop was originally a grocers and wine merchants. Connected to the deli is the home store which has a wide range of homeware, all handpicked by the small in-house team. With a wide range of books and local indie-sourced produce, this award-winning bookshop is definitely worth a visit! Your shop is in a village just off the A68, so doesn’t have an enormous amount of non-local passing traffic. So how did people get to hear about your bookshop? Is it all word of mouth or do you do any advertising? Over the years we have worked on the basis of word-of-mouth recommendations and publicity. We’ve been lucky enough to win several national awards which has generated good coverage, and our author events programme brings new customers to the shop on a regular basis. We do some very limited advertising with the Borders Book Festival. One of the topics of discussion amongst booksellers is the spine-out versus front-out dilemma. Obviously, spine-out allows for more books to be stocked, but face-out is more conducive to browsing. We love how many face-out books you managed to get onto each of your tables. Can you tell us about that? Face-out display is vital to our shop aesthetic; we are all about discoverability and serendipity where a customer may come in looking for one book and leave with five others they had no idea would be vital. We could certainly stock more titles if we replaced our big tables with more bookcases, but it would both shut down the light and eliminate the power of our face-out tabletop Perspex displays. The units are made by a local firm who we’ve worked with since we opened – everything they do is bespoke and it’s more cost effective and flexible than a large wooden unit would be. We love the Book Burrows – how did that idea come about? 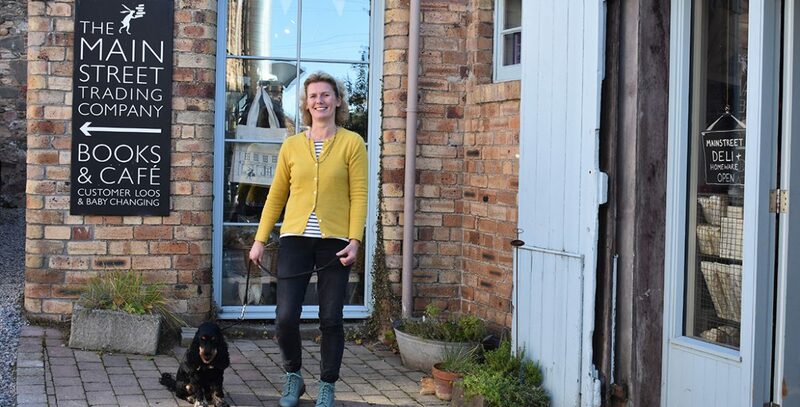 Owners Rosamund and Bill have always loved audiobooks – this partly stems from family car journeys where their three children were transfixed by the stories (no endless cries of ‘I feel sick/need a pee’ etc.). Children’s books are at the heart of the bookshop and the two large cupboards under the stairs were perfect for creating children’s dens, and these had always been envisaged with audiobooks in mind. The name Book Burrows and the decoration (one Burrow is Mrs Rabbit’s kitchen, the other is Mr Fox’s lair) were the inspiration of Philippa Henley, deputy manager of the Home shop at Mainstreet. She painted the walls, and co-created the Borrowers hidden in the floor of Mrs Rabbit’s kitchen. We also love the displays that combine a ‘hot’ book with food from the deli and homeware. They’re just gorgeous. Where does the inspiration come from? This sums up the point of Mainstreet – we always enjoy the freedom it gives us to cross-merchandise books with Deli and Home products. The inspiration comes from all sides, sometimes it’s a new homeware product that inspires a whole table display – for example, our Christmas bestseller was a range of beautiful wax food wraps by Apiary Made which we merchandised with a book called No More Plastic. It sold many more copies in Home than the Bookshop itself. Want to read about more bookshops? Check out our interview with Mr B’s.